Check out what’s new at Sun Peaks Resort! Sun Peaks Resort boasts Canada's second largest ski area with heaps of the light, dry powder Interior British Columbia is famous for. Guests enjoy award-winning downhill skiing, snowboarding and cross country skiing in the winter; hiking, golfing, downhill and cross country mountain biking, and North America's first Mountain Cross Cart course in the summer. 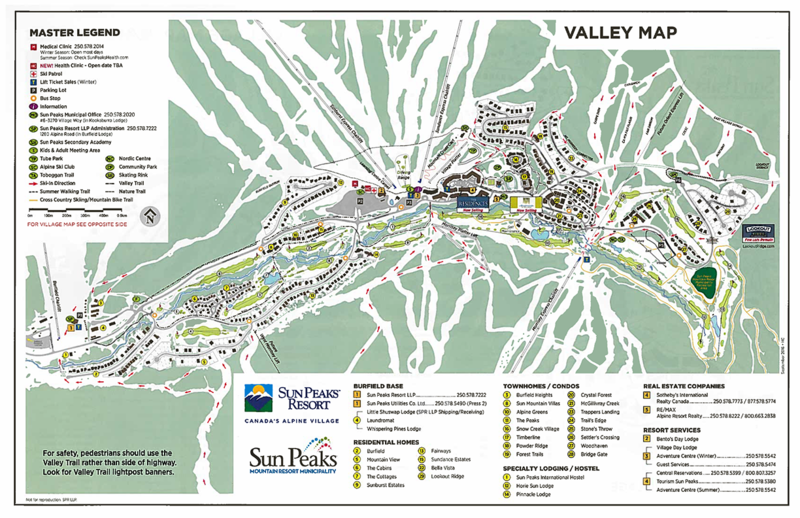 Sun Peaks became a mountain resort municipality on June 28, 2010. Their website provides a window to all municipal activities including council agendas and meeting minutes, and a notice board function to keep residents informed. 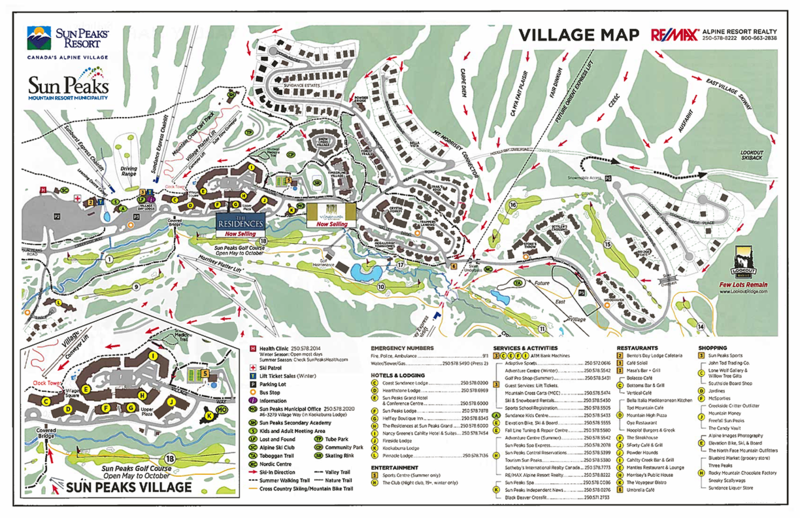 Sun Peaks Utilities Co. provides water, sewer and gas service to the community of Sun Peaks Resort, B.C. The resort covers an approximate 200 hectare area 45 minutes drive north of Kamloops, east of Barrier and west of Chase. The Utility services a population base of up to 10,000 residents and visitors. Sun Peaks Health Association, a registered charity, opened the Health Centre in 2002 to provide medical and health services to the community. Our present facility is a modular building consisting of a reception area, a physician’s office, and an examining room. We are fortunate to have a wonderful cadre of volunteers and physicians who staff the facility. It’s the Association’s objective to operate this facility and to fund raise for a comprehensive emergency care and health services centre. Sun Peaks Fire Rescue is a composite fire department staffed by three full-time officers and 30 very hard working volunteers. Both officers and volunteers are passionate about maintaining the safety and protection of the resort town’s residents, staff, guests and neighbours. Our mission statement is to promote alpine sports as a healthy and enjoyable activity for persons of all ages and abilities. We've been around for more than 50 years! Kamloops has a wealth of ski racing knowledge and former members and alumni can be found everywhere. Our home base is the Sun Peaks Alpine Club Cabin, located right on the hill. Tourism Sun Peaks (TSP) is a destination marketing organization mandated to promote the resort to the world. Founded in 1996, TSP is a not-for-profit, membership-based organization with 1,100 members representing accommodations, attractions, restaurants, retail and home owners. Our role is to promote the destination, increase visitation, develop new markets and enhance the resort’s economic impact by developing marketing, communications and promotional programs aimed at individual visitors, the convention market, business and incentive travel, weddings, clubs, schools, and the group tour market. The Sun Peaks Education Society’s primary mandate is to continue to offer a blended schooling model to our students in Grades 7 through 12. We continue to work in partnership with SD73, the @KOOL program and with our own teacher facilitator to offer the B.C. curriculum in a venue that values educational excellence, global stewardship and healthy outdoor lifestyles. Adaptive Sports at Sun Peaks is a non-profit organization whose focus is to provide opportunities for people with a wide range of disabilities to participate in adaptive snow sports and recreation programs at Sun Peaks Resort. A primary role of Adaptive Sports at Sun Peaks is to serve the needs of people with disabilities in the community of Kamloops and surrounding areas, allowing them to experience the freedom, joy and satisfaction of skiing with their classmates. The trail network in our community has a huge amount of untapped potential, and the Sun Peaks Recreational Trail Association wants to take it to the next level. Their goal is to promote a healthy community lifestyle and appreciation of our environment through the maintenance and development of recreational trails in the Sun Peaks area.